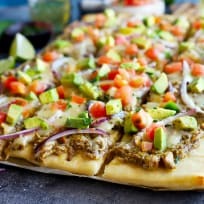 Avocado Pulled Pork Flatbread with Grilled Tomatillo Salsa is here to put the spice back into your pizza-lovin’ life. Tequila lime pulled pork is combined with a quick and easy tomatillo salsa, then topped with red onion, cheese, pico de gallo, and creamy avocado. It’s a surefire win for dinnertime! 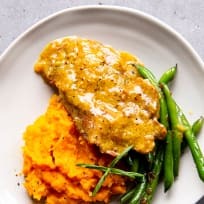 Wondering how to bake pork chops? It's super easy and we know how! How Long to Bake Bacon? Wondering how long to bake bacon? We know the answers! 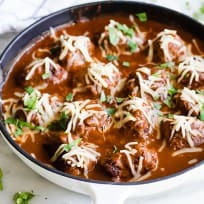 Juicy and flavorful Tex Mex enchilada meatballs are made with a combination of ground beef and chorizo, simmered in a Texas style homemade enchilada sauce. These enchilada meatballs are perfect as an appetizer, or as the main dish! Cheesy Pulled Pork BBQ Bread Dip is just the extreme tailgating fix you and your crew need for any game you are watching this season! Featuring Stubb’s famous Original Sauce with all of its incredible flavor, this meaty BBQ dip is the real deal. Made to look like a football, it’s impossible not to get in the tailgating mood! Grilled Pulled Pork Tex Mex Stuffed Avocados are a fun way to get your grill on without getting too unhealthy. With a kiss from the grill, the avocados get a little char before being stuffed with saucy pulled pork, peppers and an avocado crema. 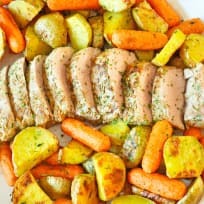 You’ll love this Roasted Pork Loin with Rosemary and Garlic! A simple but fabulous entrée that’s low-carb and company worthy! This skillet gnocchi paprikash is a filling and unique take on the traditional Hungarian dish. The pork makes this meal so filling and ultra-satisfying!